After years of knitting lace, and testing countless needles, we’ve decided that the Chiaogoo Red Lace Circular Knitting Needle isn’t just our favorite lace knitting needle, but the overall best circular knitting needle we have used. We don’t think any other needle matches its combination of performance, usability, durability, and value. To help show why we think it stands out from all other needles, we’ll go over how we picked it and how it compares to other knitting needles. It’s easy to see why the Red Lace Circular needle is Chiaogoo’s most popular product line. These needles excelled at a variety of projects we knitted – lace shawls, scarves, hats, and sweaters. Even though they have lace in the name, they can be used for any type of knitting. The stainless steel needles allow the yarn to slide easily so that you can knit faster. The tapered tips allow you to easily work everything from simple knit stitches to complicated lace patterns, but are rounded enough on the ends that the points won’t hurt you. Best of all, the flexible, steel-coated nylon cable is memory free – no twists, kinks or curls! Plastic-coated twisted steel cable means no kinking or twisting of the memory free cord. Many knitters find Chiaogoo Red Lace circular knitting needle joins work well for all types of yarn, including ones with a strong halo, such as mohair. The stainless steel needles, finished with a satin-sheen, allow yarn to freely slide without grabbing. Knitters with allergic reactions to nickel may find fewer issues with these needles. 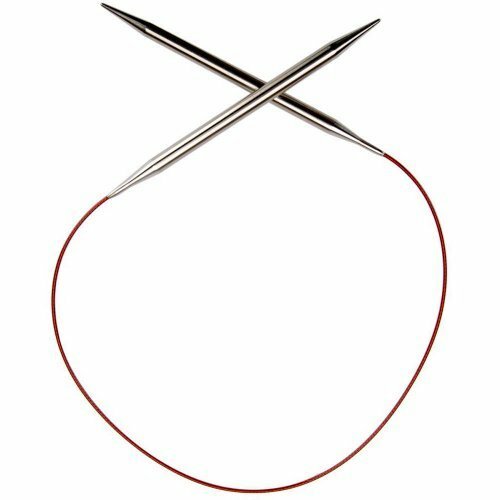 The ChiaoGoo Red Lace circular needles feature surgical-grade stainless steel needles and a plastic-coated steel cable. We found this material allows us to work faster than any other material as the yarn freely slides without friction. In fact, the cord sets the Red Lace circular apart from its competitors. Most circular knitting needle manufacturers use plastic for the cord that attaches to the needles. The problem with plastic cords is they always want to curl into a round shape, causing them to get in the way when knitting flat and to warp projects while knitting in the round. Chiagoo makes their red lace cord differently. 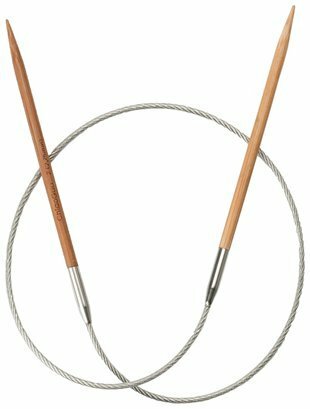 While the Red Lace circular knitting needles have a plastic cord like other circulars, inside the plastic is a twisted steel cable. This cable serves two functions – strength and no memory retention. Stronger than just plain plastic, the steel cable means the weight of your knitted project will be less likely to pull the cord from the needles. Who wants to lose their stitches during a project because the needle failed? Not me! While the cord on most circular needles stays in an “S” curve, when you remove the Red Lace knitting needles from the package, the cord drapes in a “C” curve. It stays in that soft curve shape while you knit. No memory retention means the cord stays out of your way. No curling, no twisting, no kinking…purely getting on with the pleasure of knitting. Measuring from needle tip to needle tip, the Chiaogoo Red Lace circular needles come in a variety of lengths: 16, 24, 32, 40, 47, and 60 inches. Because these are not interchangeable needles, you cannot connect additional lengths to make a longer cord. However, at 60 inches, the largest circular length provides ample room for sweaters, bulky or chunky weight yarns, or thousands of lace weight stitches. Knitting with the magic loop method or two-circulars method? Try two 40-inch Chiaogoo Red Lace circulars. At 5 inches long, the stainless steel needles give knitters with larger hands something substantial to hold onto, which means less hand fatigue during those long hours of knitting. These needles have one tip type – pointed. 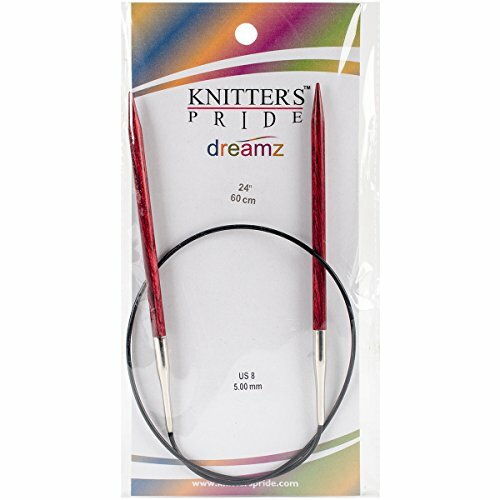 Even though they were initially made for working smaller lace weight yarns, knitters don’t have a problem using a variety of yarns with these needles. For many knitters, once they begin using pointed lace tipped needles, they always want to use them. Having trouble getting round tipped needles to work well for increases and decreases? Finding that blunt tips can’t get under yarn overs? Notice that it’s difficult working p2tbl or other twisted stitches with a round tipped needle? The sharp pointed tips on Chiaogoo Red lace knitting needles solve these problems. Admittedly, the most pointed stiletto tips make lace knitters drool with pleasure, but the tips on the Chiaogoo Red Lace circulars come in a close second. Sized US 000 – 19, these circular needles provide great variety in needle diameter. This allows you to use them for a wide variety of yarn weights. The stainless steel needles work equally well at the smallest to the largest size. If you find it difficult to read the needle size printed on the plastic cord of most circular needles, the Chiaogoo manufacturer, Westing Bridge, thought about this too. They etched the size into the stainless steel needles and not on the cord! All yarn weights and types work with these lace knitting needles. Beginning knitters may find that they lose more stitches when first using these needles, but they quickly learn how to control the yarn and retain stitches. Try cobweb (0 weight) lace weight yarn on sizes 000 – size 5. Bulky and chunky (5 – 7 weight) knit up quickly with size 9 – size 19. In between yarn weights, look to sizes 6, 7, and 8 to speed your project along. These needles are built to last a lifetime! The hypoallergenic, surgical-grade stainless steel needles are unlikely to break or warp, no matter how tightly you grip them. The cord is made of two parts – a twisted steel cable and a plastic coating – providing strength to heavyweight knitting projects. No memory retention, another advantage of the steel cable, means the plastic coating remains flexible and longer-lasting. Chiaogoo Red Lace circular knitting needles have good tight joins with multiple levels of tapering. As with any circular knitting needle, deliberately bending or kinking the cord changes the smooth functionality of the cord. Excessive bending at the join, especially repeated bending back and forth, can break the join. Although these needles may be a bit slippery for beginners, learning to work with different yarns and picking up your speed is half the fun of knitting. For die-hard speedsters, there’ll be no holding you back with the Chiaogoo Red Lace circulars. Fast stainless steel needles, pointed tips, smooth joins, and a no memory cord are all a fast knitter’s dream. Some knitters find the steel cord a bit stiff when working with the magic loop method; while for others, this is their go-to needle for magic loop. Experiment for yourself! Combined with the polished silver of the stainless steel needles, the red plastic cord gives these needles a sassy, upbeat look. Why go plain Jane when Red Lace knitting needles look so fine! Colorful needles appeal to knitters of all ages. Knitters like how these wooden needles warm up in their hands. These needles offer a surface where yarn glides, but grabs just a bit. This can make them easier for beginners to use. The swivel cable gives these needles a leg up on the competition, allowing the cord to move as you knit. The cord is firm which can make it more difficult to use with the magic loop method, but it won't kink or curl. 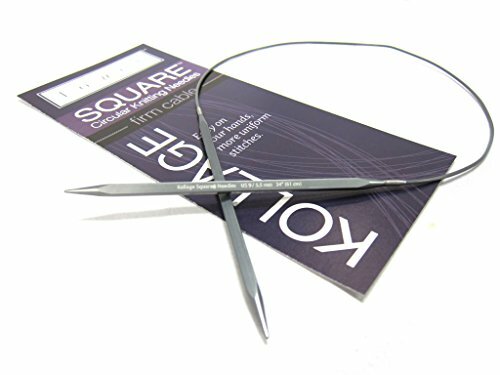 The square needles are easy on the hands and produce a uniform tension. The Addi Turbo is comparable to the Chiaogoo needle in terms of durability, look & feel, size, and speed. The Addi cord does have memory, so it can curl, twist and kink. 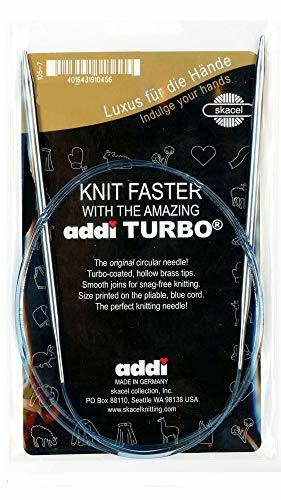 Thus, whether you go with the Addi Turbo or the Chiaogoo Red Lace Circular Knitting Needle, might come down to the cord.